Got fishing on the brain? Welcome to Key West’s City Marina, home to an incredible 250 slips that straddle the Palm Avenue Causeway over the body of water known as Garrison Bight. 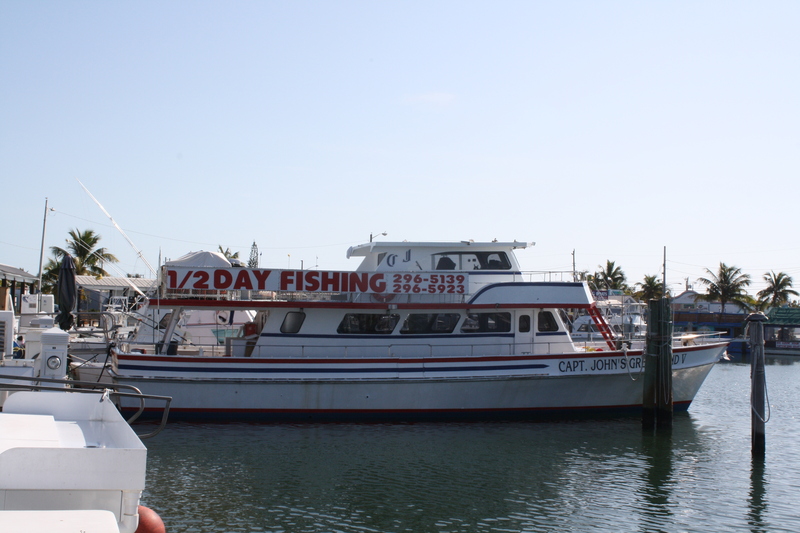 As advertised on the sign to the left, it hosts the largest fleet of experienced boat Captains in the Keys. 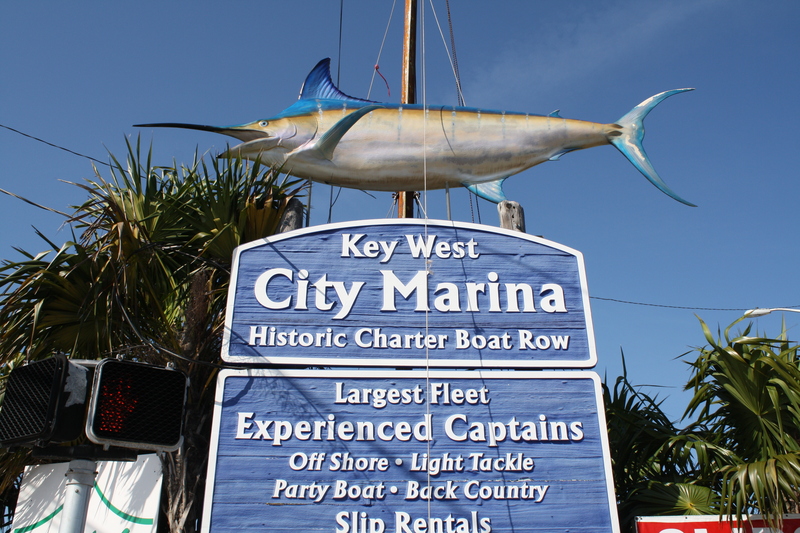 The marina has been the home of Key West’s historic Charter Boat Row fleet of boats-for-hire since the 1930’s. City Marina also has 30 transient slips. Theses slips are located on concrete floating docks. Amenities include bath and shower facilities, an on-site coin laundry as well as vessel pump-out services. This part of town is packed with other goodies like a permanent community of live aboard houseboats such as the famous ‘Smiley Faced’ rooftop featured in a previous blog. The houseboats are a site of their own making up a pleasant eclectic collection of an aquatic neighborhood. 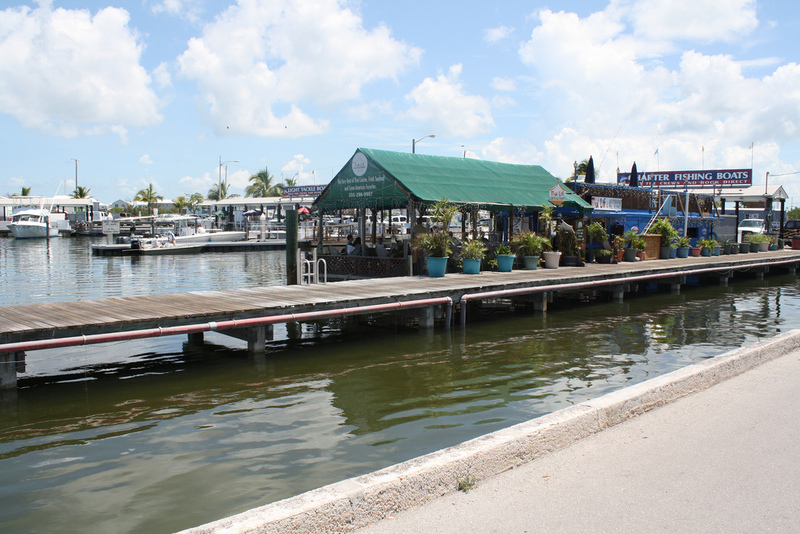 There’s also an Oriental restaurant available for your eating pleasure along with the Key West Sailing Club docks and the ‘Fly Navy’ painted building in clear sight just across the water. All of this and more can be seen from Key West’s City Marina at the Palm Avenue Causeway in Key West’s northwest portion of the island. Enjoy the view and many sights all of which are FREE for your vacation consumption. 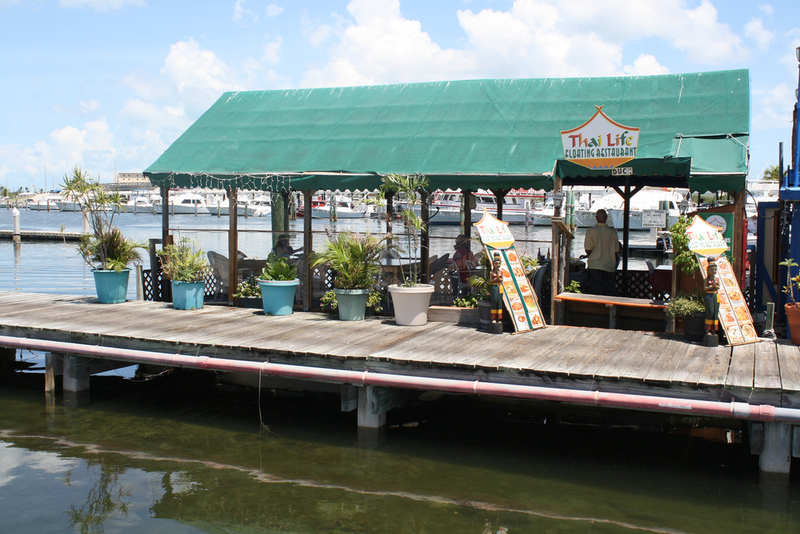 Located at the end of this City Marina Pier away from the main hustle & bustle is a unique dining experience. This is the Thai Life Floating Restaurant sitting in the body of water known as Garrison Bight (pronounced ‘bite’). Though I’ve never eaten there, it’s one of those things that I’d like to take my better half to for a quiet night out on the water. The experience I’m sure would be seared into our minds for years to come while scoring some brownie points in the process.